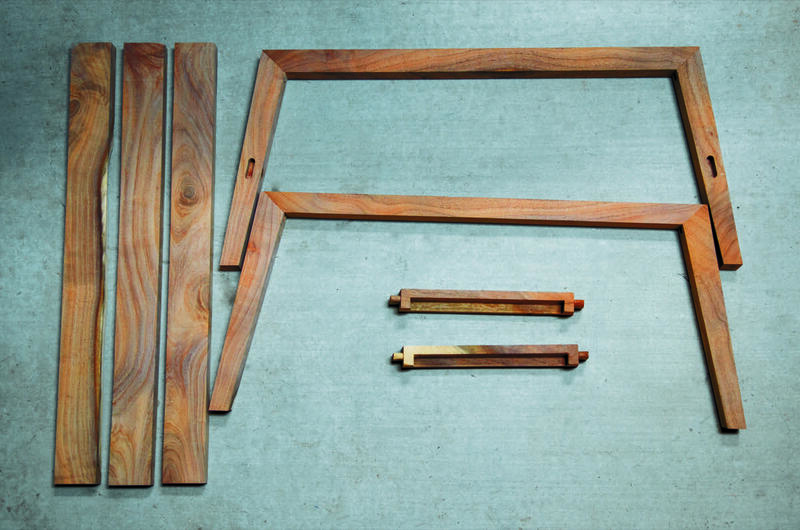 Having a plan when building a piece of furniture is essential. The plan for this mid-century influenced coffee table is fairly basic: a top, four legs, and a shelf. The curveball here is that the legs are set at an angle rather than being straight up and down. 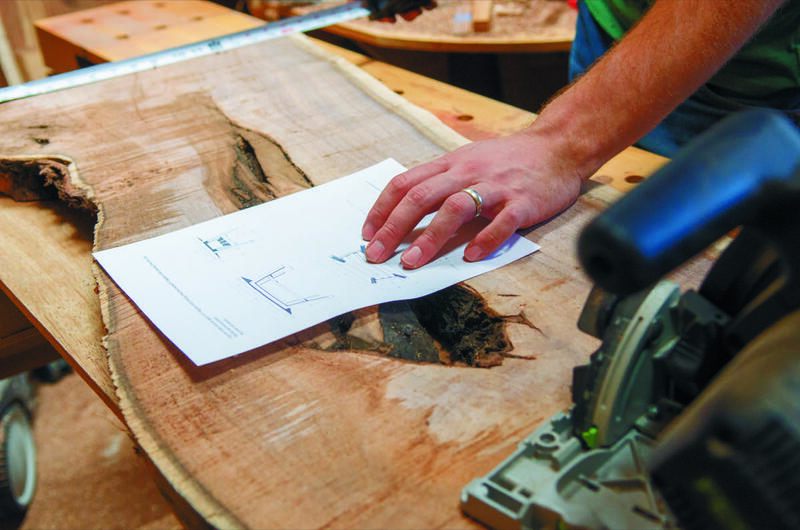 It’s easy to come up with a concept in your head, but the details of each joint, the angle you need to cut each piece, and a multitude of other details are precisely why it’s so important to have plans. Once the plans have been created, keep them handy in the shop and refer to them frequently. This isn’t to say that I always adhere strictly to the plan. As the build progresses, you may need to adapt due to material constraints or unforeseen issues. Make simple notes on the design of any changes as you go and move along. Our plans were for a table 24 inches (61 cm) wide, 42 inches (106.5 cm) long, and 18 inches (45.5 cm) high. 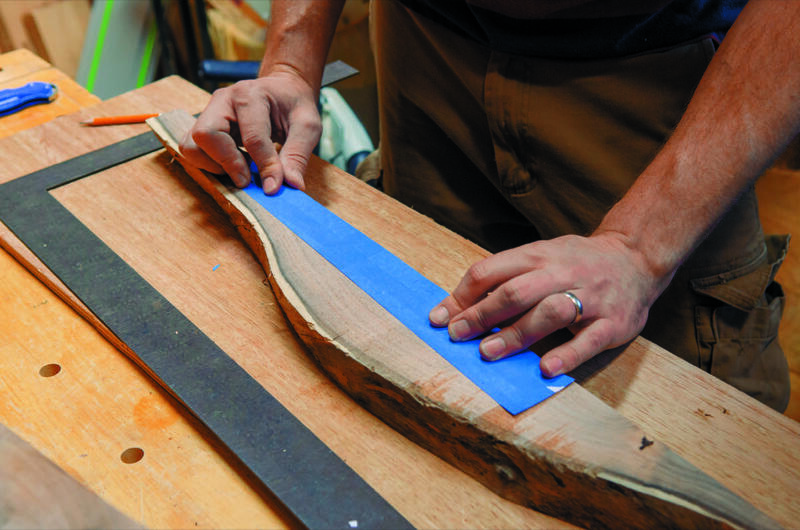 The steps to preparing your raw wood are no different than for smaller projects, just larger. The slabs you’ll be working with need to be relatively flat. Flattening multiple larger pieces of raw wood by hand will have you questioning our choice in hobbies. Use this trick for flattening slabs. 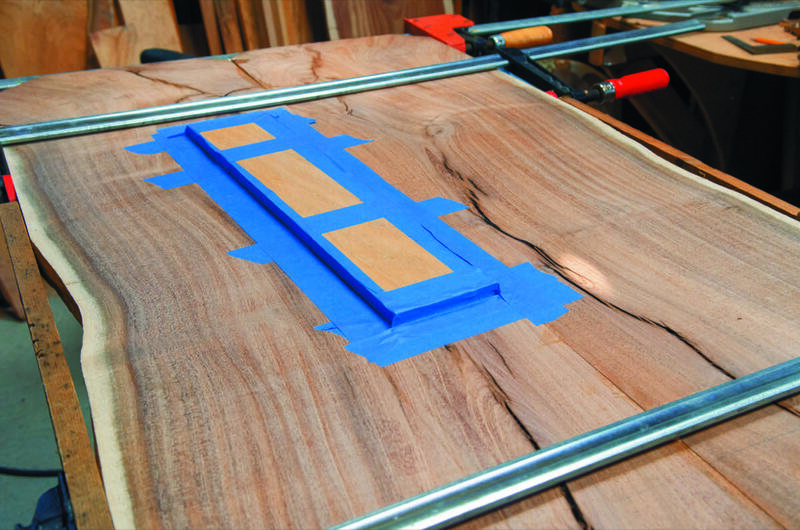 Create a sled for your plunge router that rests upon flat boards on both sides of the slab. The result is a track of sorts that allows your router, equipped with a wide, flat bottomed bit, to glide back and forth across the slab as you push the sled from one end to the other. Perpendicular side guides keep the router under control as you make pass after pass. Depending on the amount of warping present, you may have to do two passes: one for the highest spots and another to equalize the whole surface. Remember that multiple passes removing smaller amounts of material are better than single deep passes. 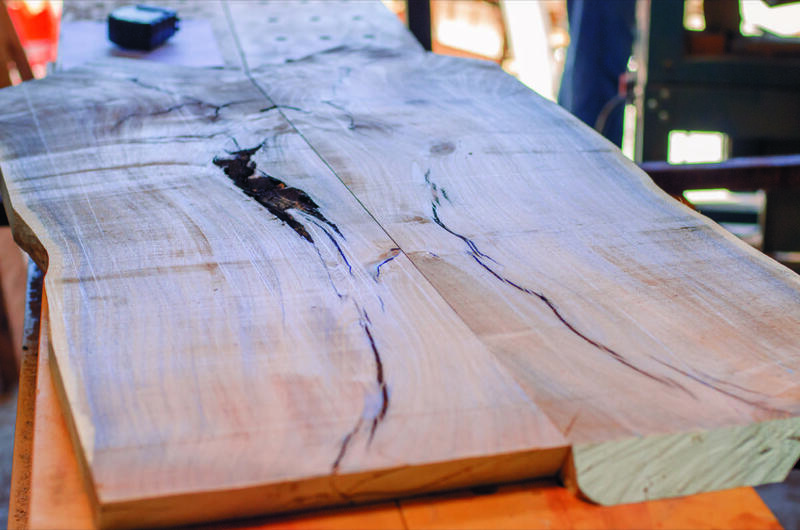 These book-matched slabs will eventually be joined together and become the tabletop. The pieces making up the legs and base of the table have very specific angles that they need cut at so everything fits together nicely at the end. 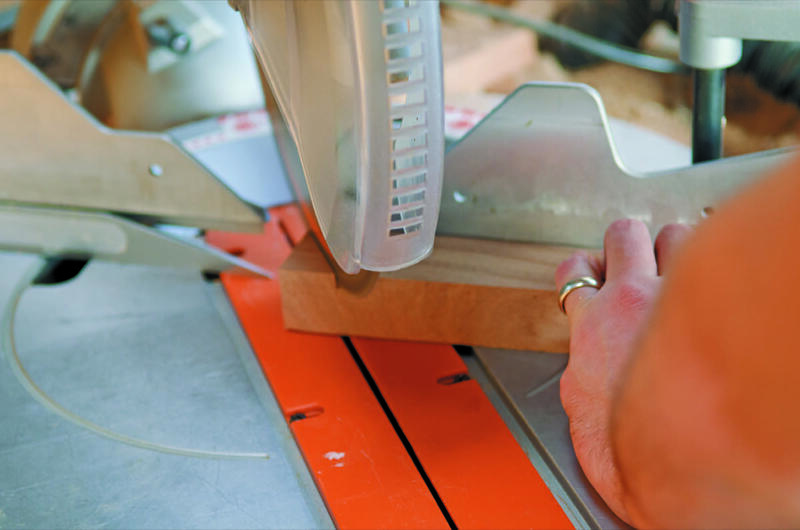 Use a miter saw for this, carefully reviewing every cut with your plans. This table has legs that splay out in both directions: 9.5 degrees toward the end and 6.5 degrees to the side. The top of the legs are cut at a 35.5 degree angle and 45 degrees on the upper support. A paper template being used to lay out tapered leg. it is time finish the table. It’s best to leave those decisions till later, after you can see the table coming together and visualize the proportions of the top next to the base. 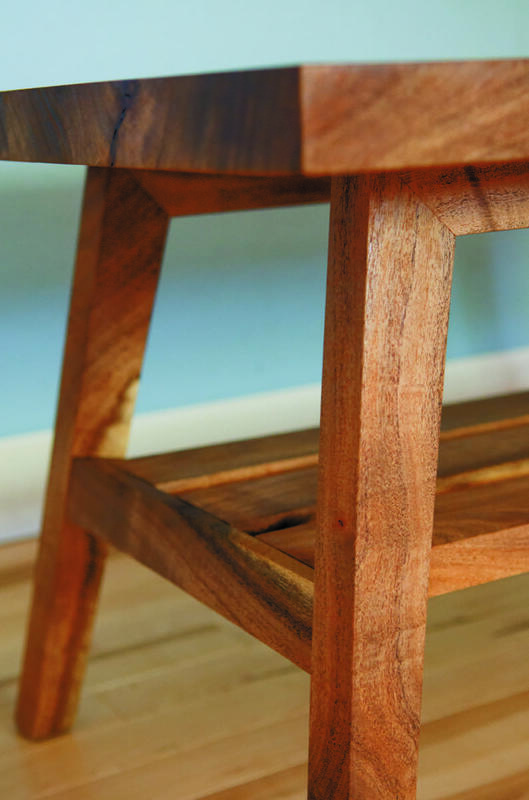 In this table, the cross supports on either end have traditional mortise and tenons. 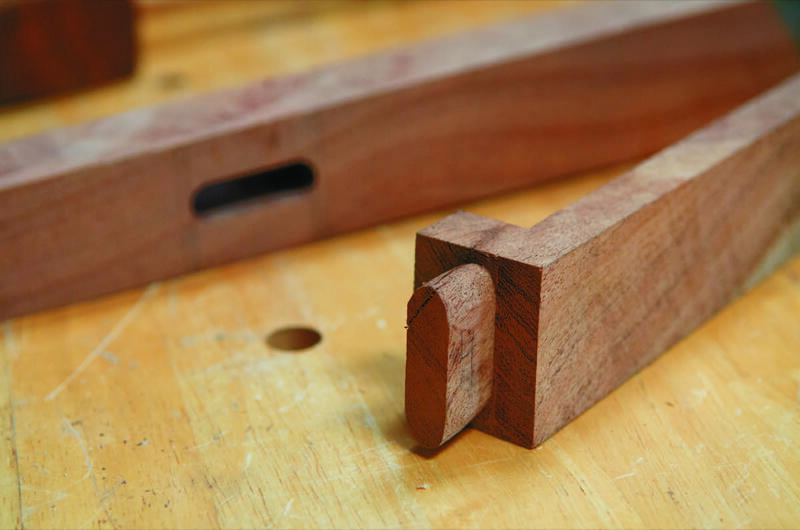 The mortise is a hollow, and the tenon is a matching protrusion which, when fit together, form a strong joint—even without gluing . When fit together, they form a very strong joint, even without gluing. 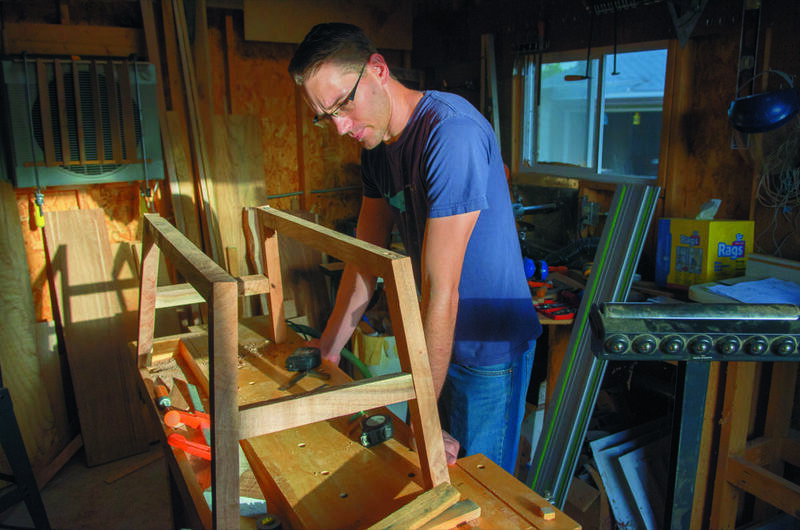 Where the legs meet the long upper supports, an interlocking miter joint is used. 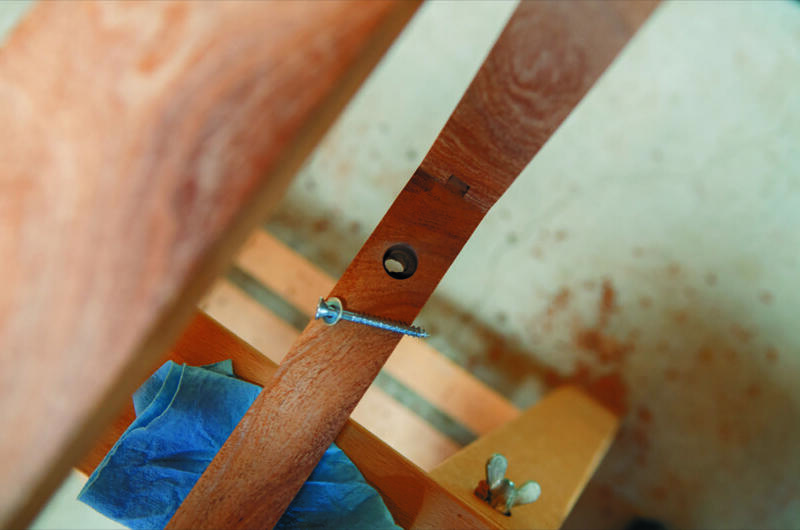 Because the miter joint isn’t always very strong, and in this case is such a critical structural point in the table, some large screws add an extra layer of strength. When reinforcing with screws, drill a larger relief hole to hide the head of the screw. This is what’s known as countersinking. 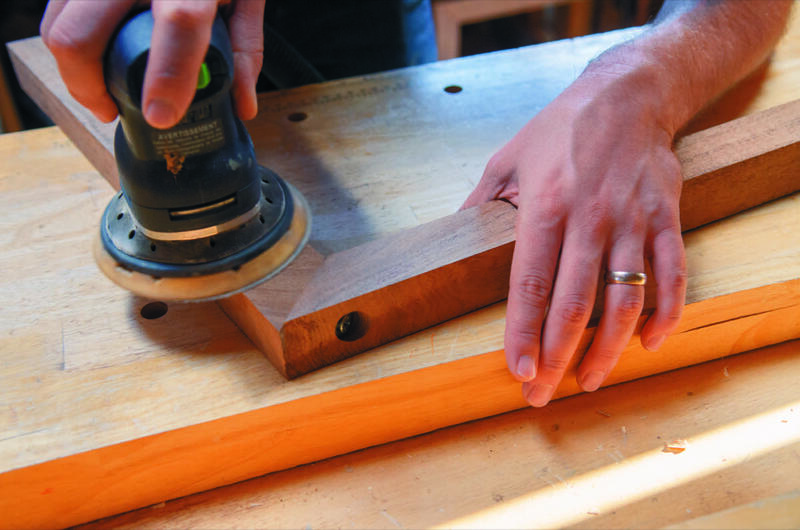 Make the mortise and tenons with a router and a straight cut bit. 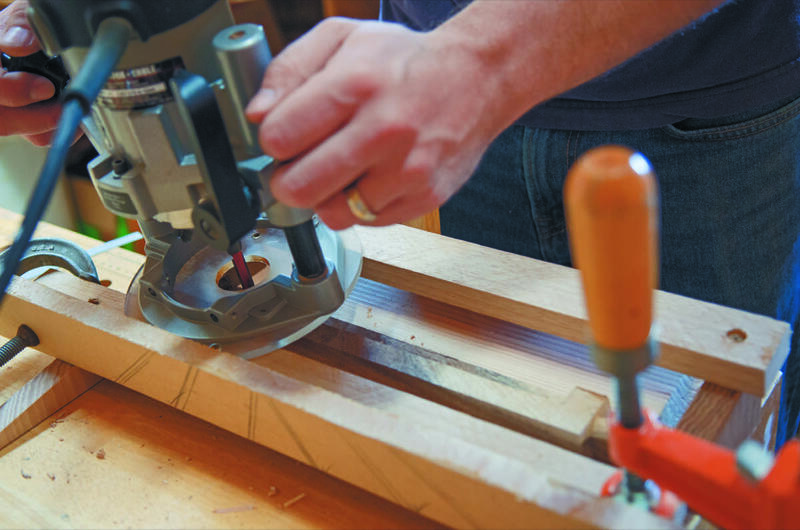 Use the plunge router to create the hollow for the mortise and the router on a table to cut the tenons. 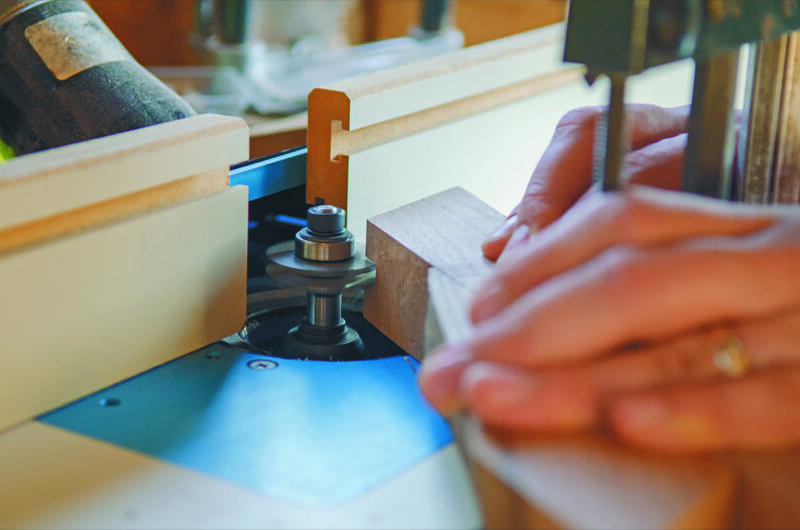 Traditionally, this joint has square edges, but since the router naturally creates a hole with rounded corners, it can be easier to round the tenons than to square the mortises. You can use a handsaw and chisel to create this joint if you don’t have a router. The legs of this table are angled out slightly not only toward the end of the table but also toward the side, which creates compound miters. Every time a joint is cut, careful attention needs to be given to cut at the appropriate angle. Thankfully, a miter saw makes this much more practical than if cutting by hand. The cross support is clamped in place below the jig, with the router running above it. The result is a recess that allows the shelf pieces to rest parallel with the ground. The other major joint in this table is where the shelf pieces meet the cross support. The inside edge of each cross support has a supporting ledge so the shelf pieces can rest flush with the support. Later, these will be glued and pinned into place with dowels drilled in from the bottom. This will provide decent lateral support, which is the structural function of the shelf. Having a long support piece running the length of the table midway down the legs keeps everything more stable when kids are pushing on it, adults are sitting on it, and during all manner of abuse that a coffee table receives. Before permanently gluing anything, make sure you do a dry fit, piecing everything together without adhesive. This dry fit will tell you if you’ve made any inadvertent errors or if you need to fine tune any of your joints. Plus, it’s just great to be able to see the progress you’ve made. Identify each piece with a light pencil mark, to keep track of where each goes and to make sure you don’t make some irreversible error later. 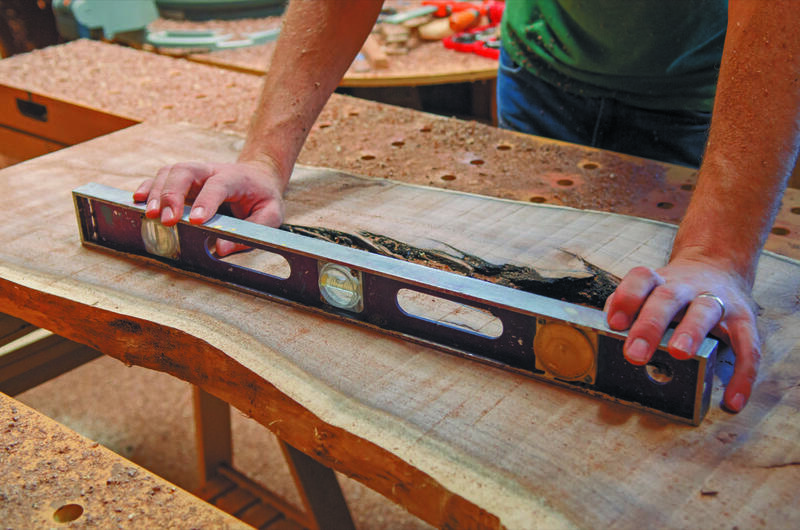 A very important part of the rough fit is to plan for how you will clamp the pieces up when gluing. It’s a bad idea to start gluing without having any notion of where to place your clamps. Time suddenly moves faster when you start gluing, and before you know it, you’ll have spent all your time fiddling with clamps and your glue will be set before everything is put together. Make sure the two pieces have straight and square edges so the joint will be nice and tight. 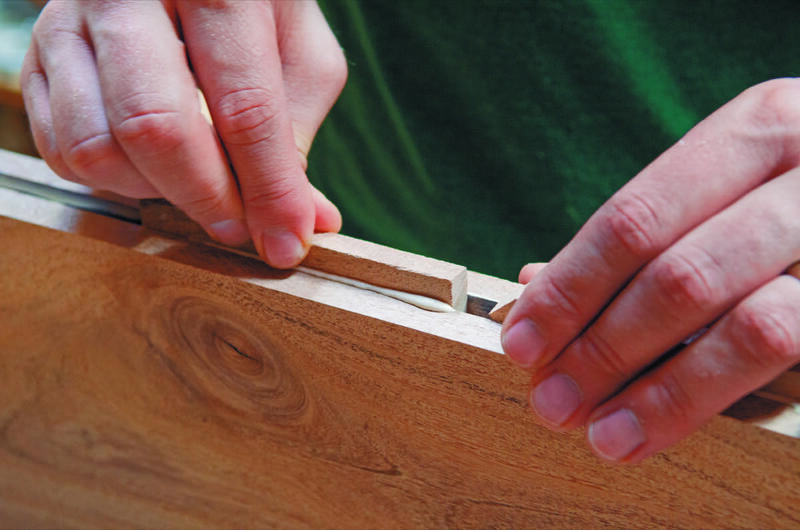 Use a biscuit joiner to give some extra strength and to keep the two pieces aligned when clamping together. Or cut a channel down the center of both slabs using a router bit and cut splines to fit as shown here. 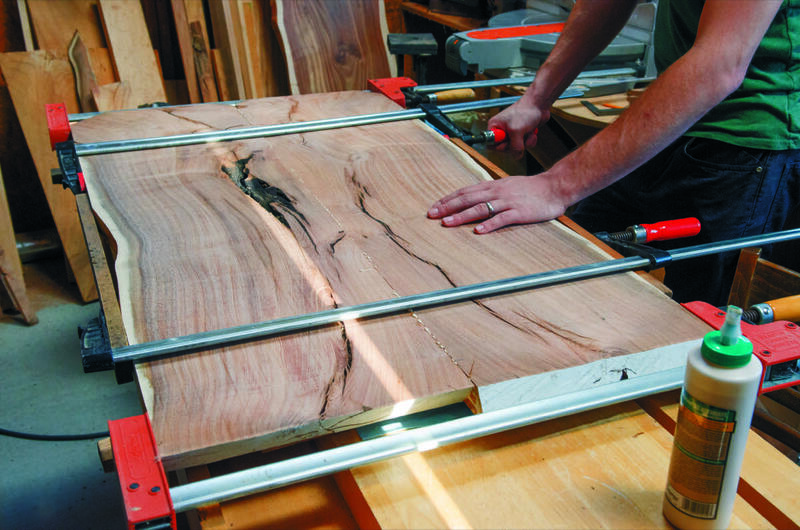 Make sure that you don’t cut the groove anywhere near the end of the slabs, especially if you plan on trimming more later, or else you could end up with a hole in the end of your tabletop. Make some marks where the two pieces should meet or find a landmark to serve as your matching point and apply your glue. Remember to alternate clamps up and down to evenly distribute the clamp’s force and to keep everything nice and flat. This step will only be necessary if your wood has voids. Mesquite is full of odd holes, dark cracks, and other anomalies, so there are plenty of places that need filling on the table top. For the base, there should not be anything to fill since defects were avoided for structural integrity. The epoxy is tinted here to match the look of the wood. The form, which is coated with a release agent, intended to hold the epoxy is taped into place. Add modeling clay around the edges to make the crack watertight. The result of all the hardwork on the base joinery. These pieces are ready to be glued together. Rough sanding a completed leg piece. After sanding, any irregularities in the joint are sanded flush for a clean miter joint. All the reinforcements will be hidden in the final table. Drill countersunk screw holes from the top of the cross supports into the legs. Apply glue to the miter joints of the legs and screw together. 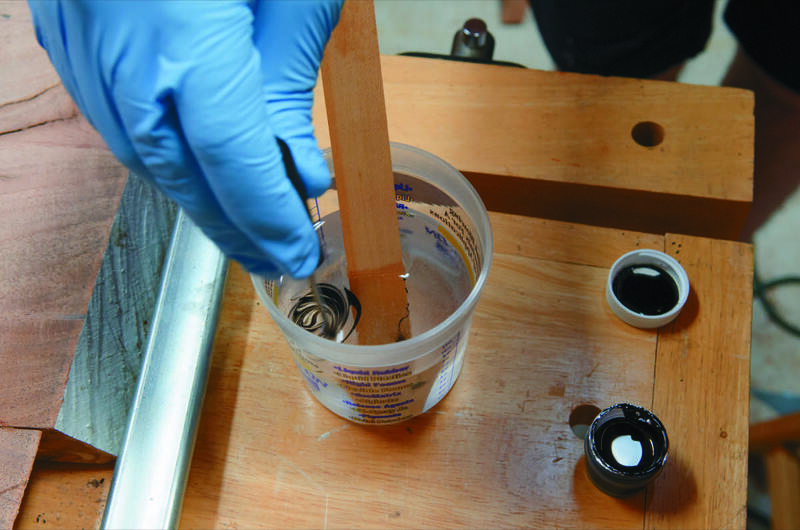 Use a small brush to apply glue to the inside of the mortises and the surfaces of the tenons. Assemble the legs and crosspieces and clamp in place. Use scrap wood to protect the legs from clamp indentations. The last piece to glue involves a dowel joint, securing the shelf slats to the cross-supports. Drill the dowel joints last because things have shifted a small amount from the dry fit, and even a miniscule change makes it next to impossible to drive that dowel into place. Drill the dowel holes from the underside of the crosspiece into the shelf slats. Mark the drill bit for the correct depth so you do not drill through the shelf. 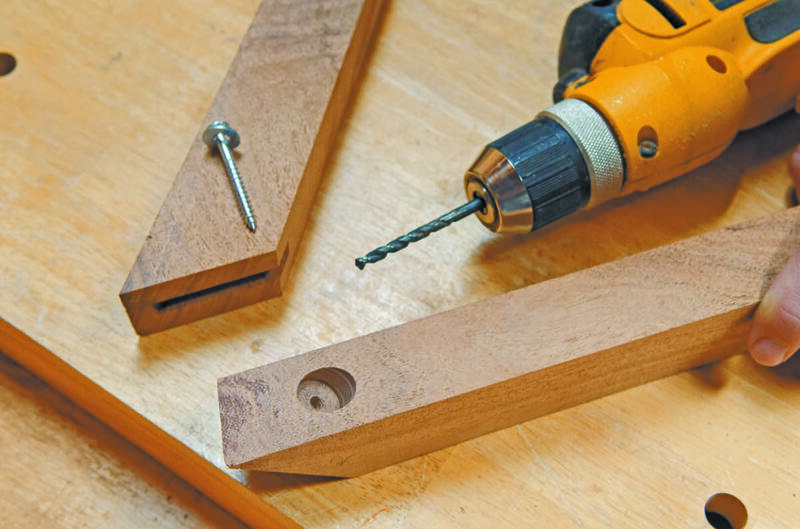 Apply glue to the dowels and assemble. After all the epoxy has cured on the tabletop, the final sanding step begins. Touch up any spots that need attention on the base, and if you hadn’t already in the first sanding step, round the corners over a bit. 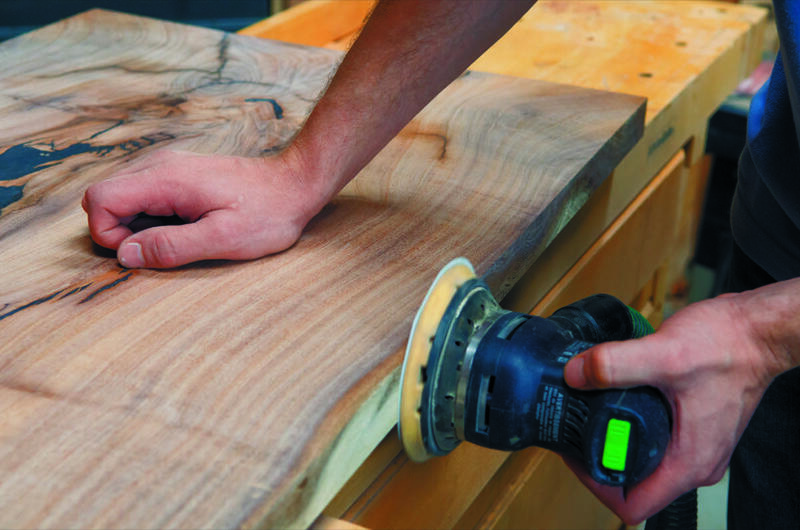 Sand the table top, beginning with a handheld belt sander to remove material quickly. 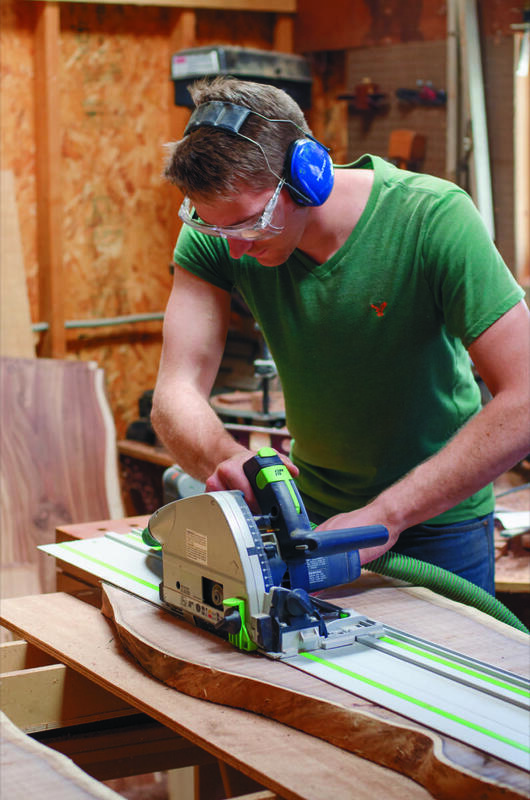 Once the rougher sanding has been done, any final trimming necessary can be done on the tabletop followed by the fine sanding with the orbital sander. 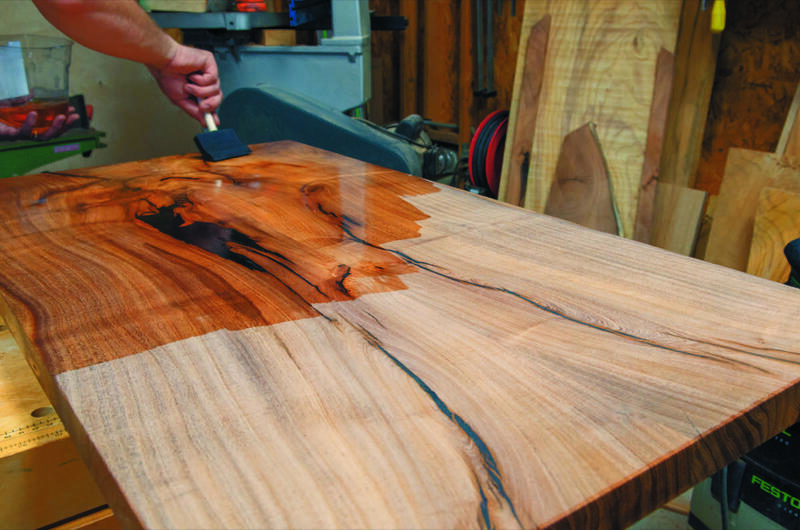 Sanding a table top is a time-consuming task, but as tedious as sanding is, the time and attention in this step will make itself apparent in the finished piece. 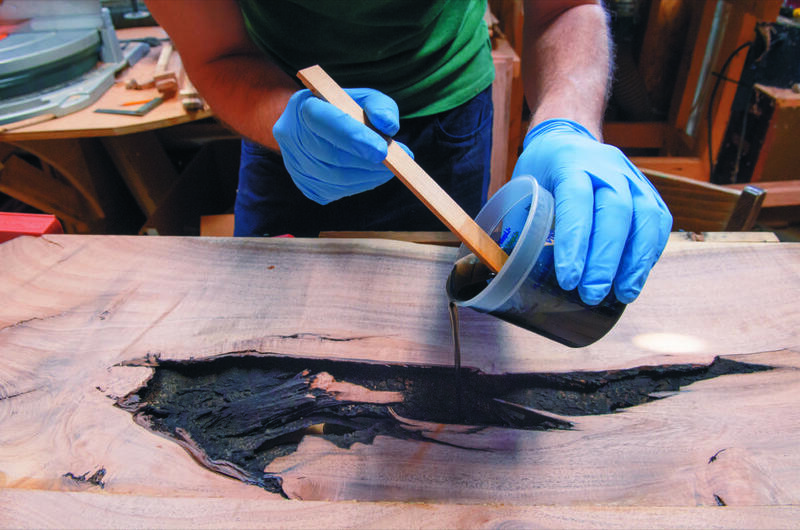 Before connecting the tabletop to the base, apply the finish. To bring out the contrast in the wood, two coats of dewaxed shellac were applied before finishing with a polyurethane on the table top to protect against moisture. 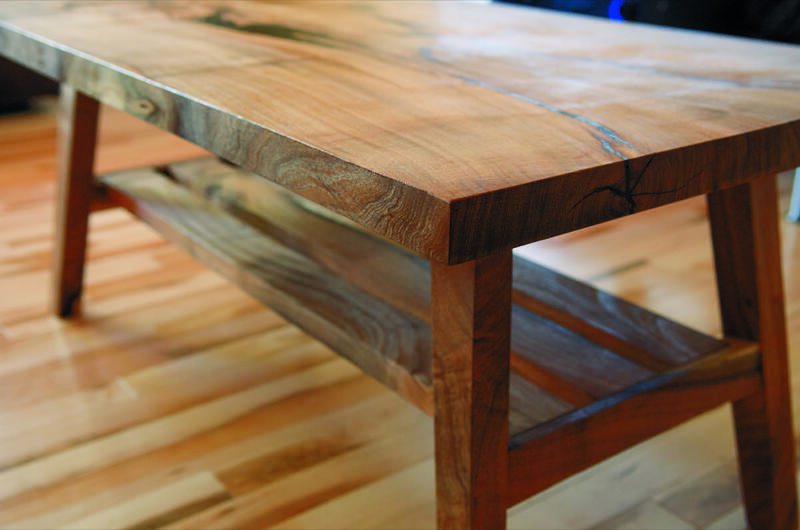 Polyurethane is more resilient than oil, so for table tops, it is a good choice. Last, but not least, attach the table top to the base using screws: one screw on each corner of the base. 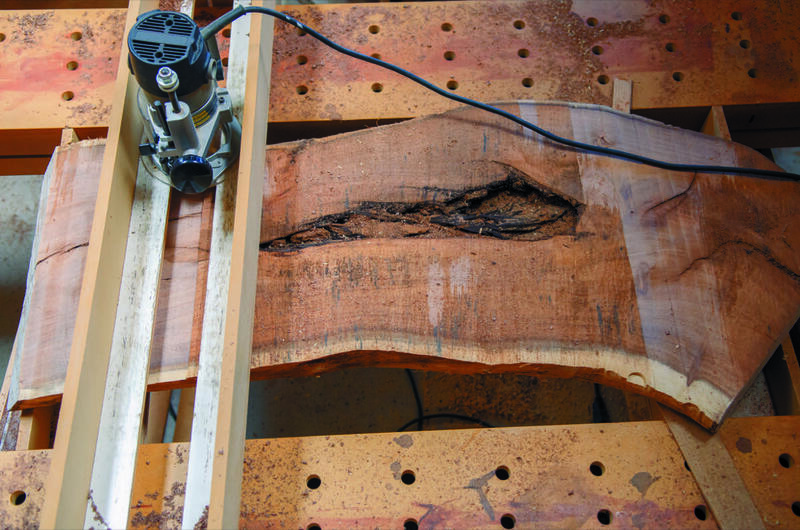 To allow for expansion and contraction that naturally occurs with every piece of wood, drill the holes in the base larger than the width of the screw. This will allow you to tighten the top down while allowing the small amount of side-to-side movement. It shouldn’t be able to be easily shifted side to side by pushing on it, but the massive amount of force behind wood movement will easily shift the screws when it’s needed. Drill the holes in the base and then set the base upside down on the bottom of the tabletop, position in the proper place, and mark and drill pilot holes for each screw. 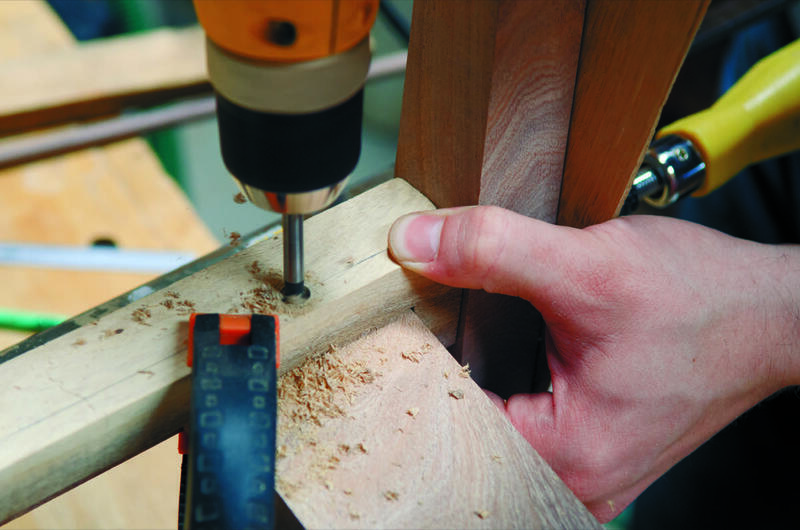 Pilot holes should be smaller than the screw by a small margin, allowing the threads to dig into solid wood. 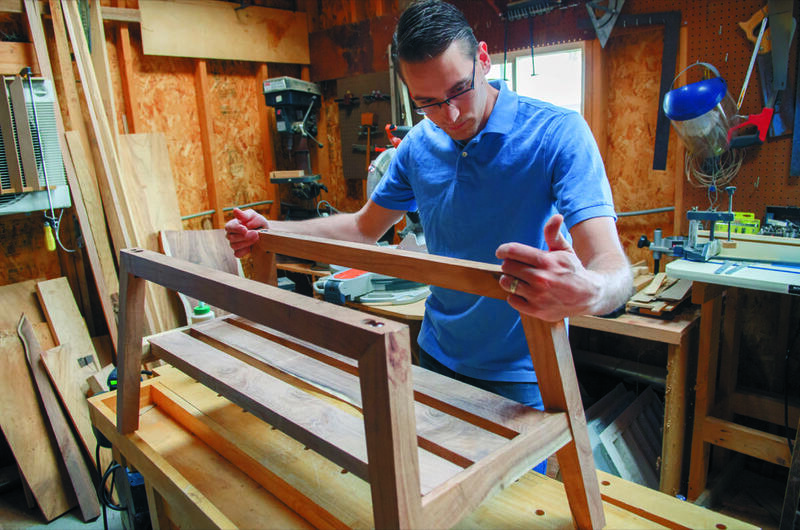 Upon completion of your first piece of fine furniture, you will probably feel a unique mixture of relief and gratification. If you made any mistakes along the way (and let’s be honest—you did), you will always remember where they are, but at the same time feel a sense of pride for the work you did and for what it became. No one else will notice the mistakes, or if they do, they will be too polite to tell you. Doubtless, in a few days, you will start to feel the need to begin a new piece of furniture, so in the meantime, sit back and kick your feet up on your awesome new coffee table. 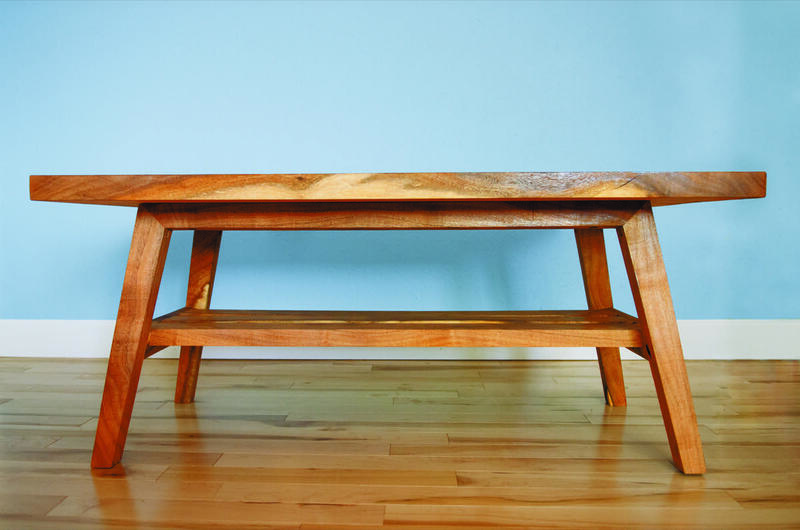 Thanks to Silas and David for sharing this awesome DIY mid-century coffee table with us, and to Quarry Books for connecting us. Pick up your copy of The Art and Craft of Wood today.